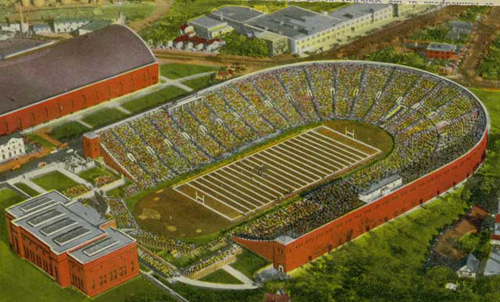 The stadium opened on October 14, 1924. It was dedicated to 3527 students, graduates, and workers who had served in World War I. The stadium sat on approximately 11 acres. During that span the team won six national championships including three consecutive (1934-1936). The championship years were 1934, 1935, 1936, 1940, 1941 and 1960. The official capacity of the stadium during the 1970s was listed as 56,652. The stadium seated approximately 66,000 people with additional temporary bleachers, although many of the seats were far away from the field. The stadium-record attendance was 66,284 against Purdue on November 18, 1966. Memorial stadium also served as the track and field venue for the University of Minnesota teams, and due to a conflict with a Minnesota Twins playoff game at Metropolitan Stadium, the NFL's Minnesota Vikings played a 1969 regular season game against the Green Bay Packers at Memorial Stadium. Gophers coach Glen Mason, who normally dodges stadium-related questions, shared his desire for an on-campus, open-air football stadium and stressed how such a stadium would greatly enhance his program. "There are a lot of things that go into having the best possible program in college football," Mason said Wednesday during his weekly press conference. "It's not just winning and losing. It's everything that goes with the whole game-day experience. One of the great things about the Big Ten conference is the game-day pageantry. It's not just a game. It's an event." That same spectacle usually is absent at the Metrodome, where the Gophers have played since moving from Memorial Stadium in 1982. Even as Mason rebuilt the Gophers into a bowl contender after nearly a decade of losing, the nonconference home paid attendance figures have slipped in each of the past three years, from 46,195 in 1997 to 35,800 this year. Actual attendance for this year's three-game sweep of Ohio University, Louisiana-Monroe and Illinois State was more than 10,000 less per game than the paid attendance. There is no plan to build the Gophers a new stadium. And that, Mason said, makes it harder to compete in the Big Ten. Mason used Ohio State and Penn State as examples of Big Ten universities that are committing more than $100 million each to upgrade their football stadiums. Northwestern and Iowa are two other Big Ten schools that recently have invested millions in their football programs, Gophers athletic director Mark Dienhart said. "When you look at what is happening nationally with the amount of investments that these great academic institutions are making in athletics and football, it's mind-boggling," Mason said. "I think there is an importance there. There's a demand for that, not only to stay competitive in recruiting, but to keep the alumni and supporters coming back to your campus. I think we're lost in that area." University president Mark Yudof has said repeatedly that a new stadium for the Gophers, which probably would cost about $400 million, won't be on his capital agenda anytime soon. The university already is undergoing a three-year, $850 million construction project. "[Yudof has] the most complicated job in the state as it is, and that already complicated job has been further complicated by the athletic department the past six months," said Pat Forciea, marketing consultant to the men's athletics department. "About the only way it could be more complicated is if by some way we were to step into the stadium debate." University officials agree that is not about to happen. "It would be wonderful to have a stadium at a certain point in time, but I expect that's not an issue on the short-term horizon," Forciea said. "The university has far more pressing needs right now." The university, however, is concerned about the future of the Metrodome. The Vikings and Twins both insist they cannot stay in the dome and be competitive. "If the stadium debate really starts to heat up with the Vikings, we would like to be at the table," said McKinley Boston, the vice president for student development and athletics. "We have no other place to play our football games." Mason knew he was going to create a stir when he agreed to answer a question about the Metrodome. "I normally try to dodge questions about the dome, but you guys [the media] caught me in a good mood, and I've had too much coffee," Mason joked. Mason also shared a funny story from a recent speaking engagement he had in Edina. "I fielded a question like this about the dome," Mason said. "And I said, 'Well, heck, I don't know. We play in the dome, and it's great because that's where we play.' But then I said, 'Besides being the head coach at Minnesota, I'm also a taxpayer. So, speaking from a taxpayer's standpoint, if we're going to take tax dollars and build a new stadium, let's build one for the Gophers because we're not going anyplace. We're not going to threaten to move to Mankato if you don't give us free hot dogs. "And you know what?" Mason added, "I got a standing ovation."